How do massive stars turn into black holes or neutron stars? Some of the answer to that question is blowing in the wind. When massive stars (stars about 10 or more times the mass of the Sun) run out of nuclear fuel, the dead nuclear furnace at the center of the star will collapse into some type of very dense object, either a black hole or neutron star, depending on the mass of the star when it dies. But massive stars continually lose mass throughout their lives, so their final mass can be much smaller than their initial mass. An important way in which a massive star loses mass is through its stellar wind. Because massive stars are so hot and luminous, the force of the radiation they generate pushes material from the star's surface, creating a strong outflow speeding into space. 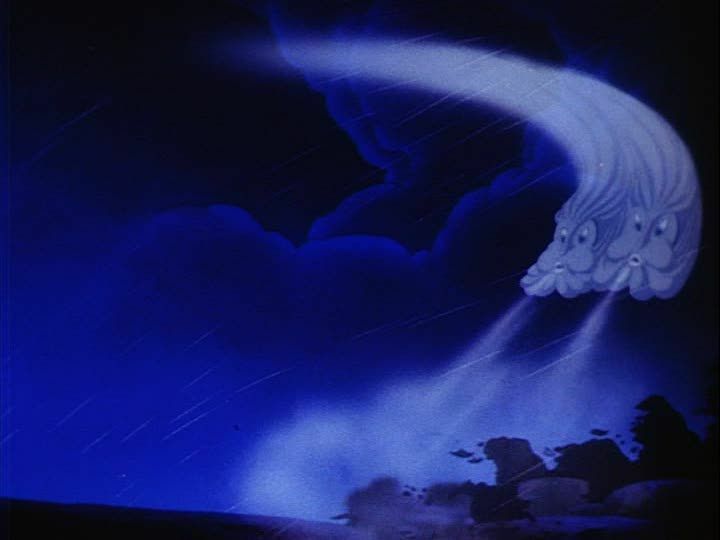 Such stellar winds are very powerful, and have very high speeds (more than a million miles per hour, generally). The mass lost through the stellar wind also plays an important role in shaping the environment around the star and enriching it with complex chemicals needed for life. Theoretically, the amount of matter lost in the wind depends on the brightness of the star and the composition of the wind. Measuring the amount of mass lost in the wind can be tricky, and depends on whether the winds are smooth or clumpy. A new study using data from the Chandra X-ray Observatory provides one of the best measurements of how smooth a stellar wind really is. This study used X-ray observations of a high-mass X-ray binary star system called OAO 1657-415. This system once consisted of two very massive stars. The more massive star ran out of fuel first, exploded, and left behind a tiny, extraordinarily dense neutron star in orbit around the other star. The dense neutron star accretes wind material from the companion star, and this accreted material heats up and produces X-ray emission. The X-rays can be used to probe of the spatial distribution of the stellar wind. Analysis of the X-ray emission from OAO 1657-415 revels that the neutron star passed through a large, dense clump of material about 1 million miles in diameter (about twice the size of our Sun). 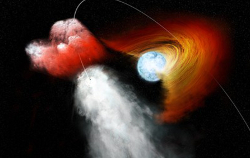 This is illustrated above, where the blue-white, hot massive star which drives the stellar wind is shown on the right, the orbit of the neutron star is shown by the thin white line, and a large, thick clump of stellar wind material is shown on the left. Studies like these give astronomers a much better understanding of how much mass is lost by big stars throughout their short, flamboyant lives.